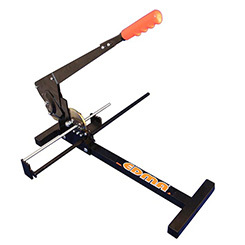 EDMA are a French firm who have been designing and manufacturing their tools in France since 1937. Their range of professional quality tools includes products for flooring, roofing, masonry and external wall work, as well as decking and fencing. What's more, all products from the SuperPro range have been designed to meets the needs of modern professional tradesmen around the world. The company employ ergonomic designs to minimise the physical stress of use and help prevent injury. They are also designed to minimise the creation of dust and noise which can be harmful to the health of workers and those around them. Most EDMA tools come with a two-year warranty for your peace of mind, except for any electrical tools which have one year, and laminate flooring guillotines which are covered for five years. If you are working on a roof repair or replacement, then Edma has everything you need. Whether it's a ladder clamp, their heavy duty batten lifter or precision cutting of slates with scribe and guillotine, there are products designed for the job. The same applies for fencing or dry wall repairs; whether you are a professional or undertaking a serious DIY project. For the latest EDMA trade tools for your project, browse our collection at My Tool Shed today.